It's been a month and half since my beloved Georg left this earth. Grief has not diminished, but rather grown. Not a day goes by that I am not brought to tears. It might be a picture, a movie, something a friend says, an article of clothing. A few weeks ago it was when a friend surprised me with a card from Georg on Valentine's Day. He had asked her to bring it to him in the hospital so he could sign it. She told me he was hardly able to hold the pen. 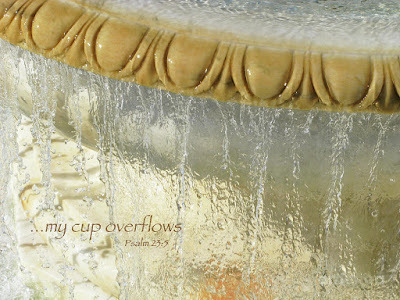 In shaky writing he wrote: "My cup runneth over". Love, Georg. It was the devastating last missive of hundreds of letters, notes and cards I got from him since we were kids, all of which I have saved. I could only wonder what he meant by writing that and I supposed I would never find out, at least in this lifetime. Why would someone write "My cup runneth over" when they were in pain and dying? I have not been able to bring myself to go downstairs, to his home theater where he sat for hours in his easy chair watching TV and playing games on his laptop. But tonight something drew me down there and I had an overwhelming need to sit in that chair. As I sat, I looked at his collection of pens, puzzle books, laptops, miscellaneous scraps of paper. I picked one up. It had writing all over it: doctor's appointments, dates, phone numbers. In one corner something he wrote caught my eye: "My cup runneth over. Psalm 23". Psalm 23, the one always read at funerals. Slowly the realization came to me: somehow he led me to discover that scrap of paper to let me know he "dwells in the house of the Lord forever."